Shopping for Star Wars Statues? Gentle Giant and Chronicle Books team up to bring you an amazing collectible! Wonderfully re-created animated maquette of author Jeffrey Brown's Vader's Little Princess! Limited edition of 1,500 pieces and comes with an exclusive edition of Vader's Little Princess! My hero… Gentle Giant Ltd. and Chronicle Books are proud to bring the hilarious and sweet Darth Vader and Son comic to life! The artisans at Gentle Giant Studios have captured the hilarious and sweet comic re-imagining Darth Vader as a dad like any other - except with all the baggage of being the Dark Lord of the Sith. Traditionally sculpted by the Artisans at Gentle Giant Studios, no detail has been overlooked on this Star Wars Vader's Little Princess Maquette Statue. 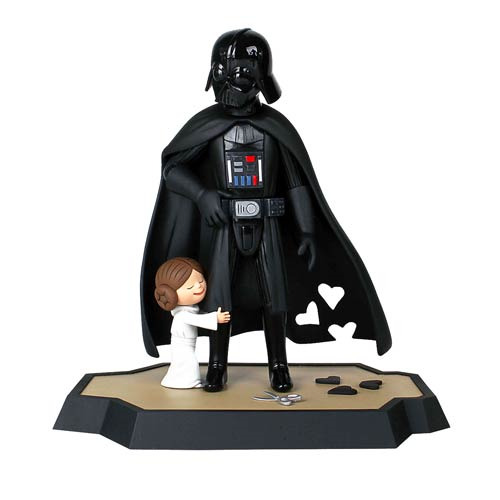 Based on Jeffrey Brown's Vader's Little Princess book; this individually hand-numbered cold-cast polystone collectible has a bottom stamp with a matching certificate of authenticity and is a limited edition of 1,500 pieces. Celebrated artist Jeffrey Brown's delightful illustrations give classic Star Wars moments a fresh twist, presenting the trials and joys of parenting through the lens of a galaxy far, far away. Life lessons include Leia's embarrassment at being dropped off at school in an AT-AT Walker, learning to pilot a TIE Fighter, boyfriends ("Rebel scum! "), and the special bond shared between any father and daughter. This fantastic limited edition, hand-numbered collectible maquette comes with an exclusive edition of the Vader's Little Princess book with 16-page signature of the original black and white concept sketches from Jeffrey Brown! These sketches have not been released to the public until now, and are exclusive to this boxed set, and it even comes with a full-color illustration from Jeffrey Brown printed on the board and packaged in a vellum sleeve. The book cover and spine will be printed with color foil stamps and spot gloss varnish. Ages 14 and up. Jeffrey Brown is the author of numerous graphic novels and comics, including Cat Getting Out of a Bag and Cats Are Weird. A lifelong Star Wars fan, he lives in Chicago with his wife and five-year-old son.